– A period of near-record heat ended with two severe lightning storms travelling through the Napanee area. High winds and lightning strikes did considerable damage to trees and buildings and the Gibbard Memorial Baseball Park was no exception. A lightning bolt splintered the park’s flag pole and tore boards off the outfield fence. Elsewhere, two horses in the region were struck and killed, a small barn in Clarksville was completely destroyed by fire, and a fallen tree punctured the roof of a Mill Street home causing considerable water damage from rain. The framework of a new house was also badly damaged by a tree limb. – An umpire’s decision to halt a playoff baseball game between Yarker and the Napanee Legion early due to a lack of daylight prompted a series of protests. First, the Legion team called into question the umpire’s decision, then the Yarker team protested the league’s ruling to replay the game. Ultimately, the Ontario Baseball Association upheld the decision to replay the game and the Legion went on to win the game and series for the right to face Marlbank for the district final. – With the Lennox and Addington Chamber of Commerce and local service clubs partnering with the fair board to provide entertainment and exhibits, there appeared to be more interest in the Napanee Fair. Attendance was expected to increase. 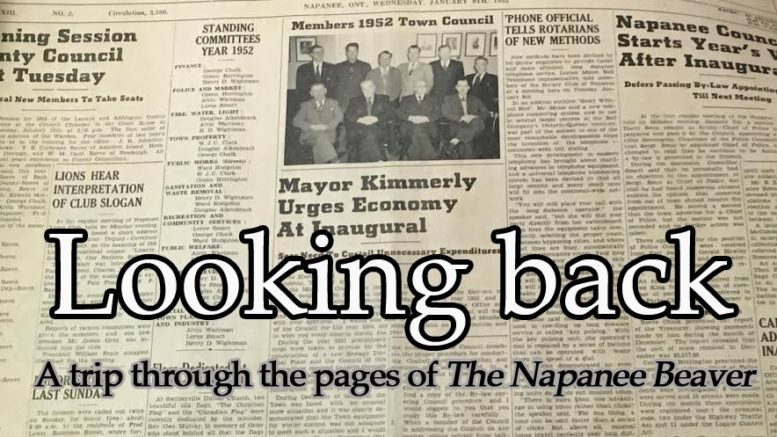 – Napanee was mourning after losing an esteemed journalist and civic leader too soon after Beaver publisher J. Earl Morrison suffered a fatal heart attack at age 56. Morrison had owned the Beaver since 1953. Also the publisher of the Picton Gazette and founder of the Oakville Beaver, Morrison had served as president of the Ontario Weekly Newspapers Association in 1973 and was also active with the Canadian Community Newspapers Association and Commonwealth Press Union. In Napanee, he was a former Rotary president and was well-known for his interest and involvement in music and theatre. – Richmond Township officially opened a $50,000 baseball diamond and playground with about 500 residents present. Community fundraising and government grants helped the township secure the six-acre site and develop it into a community park. – The Lennox and Addington County Board of Education told Colebrook parents if they planned to defy changes to school boundaries, they should seek legal help to do so. Board chair Hugh Kerr told parents that the Enterprise Public School principal had been instructed to turn away any students outside the new boundaries looking to register at the school.